1.30 pm – Maker Studios. Video is the hottest medium on the Internet, and the model keeps evolving, as the recent YouTube Red news illustrates. Maker is one of the most successful of the original “MCNs” and has grown past its YouTube roots into a powerhouse in all things video. I want to get behind the scenes and learn about video because NewCo will be launching video channels next year, along with its media business. I also want to see the Culver City neighborhood where Maker has its HQ – it’s home to an abundance of LA’s best entertainment startups. Wish I could go: Cross Campus, MomentFeed, Inspire Energy. 3.00 pm – Hired. Another selfish business reason here: I’m very interested in the recruitment field, both because NewCo is growing, but also because I sense opportunities for what we’re building as well. Hired has been on a tear lately and has a lot of buzz. I’m looking forward to seeing how the sausage is made. Wish I could go: Tradesy, Omaze, Google. 4.30 pm – USC Institute for Creative Technologies. Who knew Oculus Rift came from the lab we’ll be touring during this session? Very cool. Also, my daughter is looking at USC for college (kills me, I went to Cal…) and this is a chance to check out an innovative program at the school. Wish I could go: Factual, Homeboy Industries, NOVICA. 6.00 pm – VIP Kickoff & Reception at Dollar Shave Club Dollar Shave Club Dollar’s headquarters are really cool, and the program – featuring Dollar Shave CEO Michael Dubin and a host of other NewCo CEOs. 9.30 am – Hyperloop Technologies If these guys pull off what they are talking about doing, well, it’ll radically redefine long haul transportation. I want to be able to say I was there back when it was just an idea. Plus, I’ll get to meet the CEO and grok the tech behind it. Wish I could go: The LA River Revitalization Corporation, Oblong Industries, dSky. 11.00 am – Office of Mayor Eric Garcetti Office of Mayor Eric Garcetti One of the things I love about NewCo is how the municipal governments get involved, both at the VIP kickoff and by opening their doors and talking about civic innovation. I’m looking forward to seeing what’s new at LA’s city hall. Wish I could go: Psychic Bunny, CBRE, FEM, Inc.
1.30 pm – Soylent. This food-replacement drink has been the subject of much derision and celebration. But it’s certainly pushing the envelope of how we think about nutrition and the role of food in society. Wish I could go: Science, Inc., Funny or Die, Upfront Ventures. 3.00 pm – Surf Air. Another new approach to transportation – one that promises to rethink how we do shorter haul flights. We’ll get to board and tour their airplanes as well! Wish I could go: Parachute, Expert DOJO, VNTANA (another Manatt pick). 4.30 pm – Flightly. I’ll admit, Flightly’s location helped me chose it (bc it’s near the meetup afterwards, and traffic is rough in LA in the afternoon!). Then again, I’ve wondered about the company ever since it was announced as Twitter’s only e-commerce integration. I’ve long thought Twitter had a huge e-commerce business lurking inside of it – and now’s my chance to hear about it from the source. Wish I could go: WeWork, onefinestay, Crowdfunder. 6.00 pm – Meetup at Boingo Wireless Boingo Wireless After seeing a dozen companies, it’ll be time for a drink and conversation with my fellow NewCo festival goers. See you there! 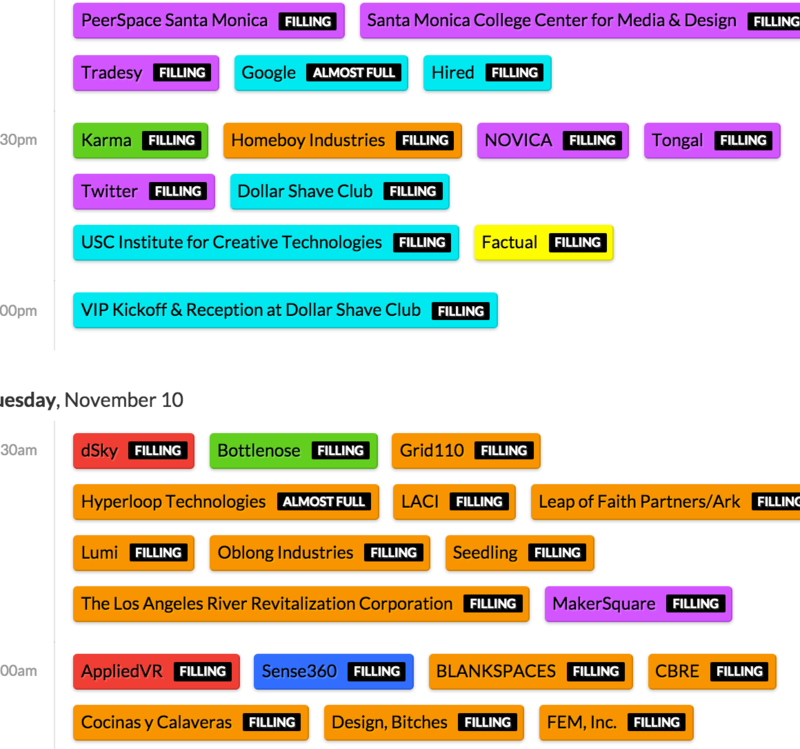 Register for NewCo LA here! Previous Previous post: Do It Right. Not Fast. Right. Next Next post: Written First On Medium. Discuss.